There are quick and safe ways to minimize the appearance of spider veins. At Monarch Aesthetic Medicine, we use the Lyra-i™ laser system to deliver long, laser flat waves through the skin and into the veins, breaking them down and allowing them to be absorbed by the body. The Lyra-i system combines the longest available wavelength with a unique flat beam profile to maximize patient safety and efficacy. The procedure requires no downtime, so you can return immediately to normal activities. 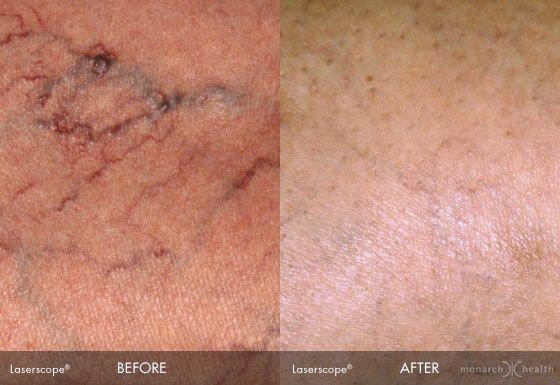 Most veins will disappear quickly, and best of all, this procedure works beautifully on all skin types and colors! Dr. Cole-Sedivy may recommend a combination of Lyra Laser therapy and Sclerotherapy for amazing results! Our treatments are affordable, comfortable and effective with virtually no downtime. Expect up to 80% improvement. We use Asclera, as seen on Dr. Oz, as our agent of choice for sclerotherapy. Enjoy the clear skin and smooth, beautiful legs you desire!